We can't seem to keep up with weekly newsletters, but doing our best to get these out to you as often as possible. There's lots of news and great links to share so please read on to get yourself back up to date with What's New on ExplorOz. User Treks: another 34 new user treks have been added since our last newsletter and all created from active track logs via the ExplorOz Traveller app. Please read this updated article, "User Treks: Instructions" for a clear explanation of how you can use them. One of the best ways is to embed the User Trek (displays the map of your trip) into your Blog, or even into your own website if you have one. See our latest ExplorOz Team field trip Blog to see how this looks. Brushman of the Bush Dies, Iveco Daily, 2019 National Gathering, Woomera Exclusion Periods for Amber Zones, EOTopo Online.. deep link?, CIL Insurance Renewal, Electrical Question - Aux Battery Setup, 29 March Update from the Birdsville Policeman, Tobermorey Station Hit by Flood, Batteries connection in parallel, Travel Photography - Gear - Editing - Sharing, Cordillo Downs Woolshed to be repaired this year, Kati Thanda/Lake Eyre up close Sat Image, LDV 4WDs are quite impressive in my opinion, Fundraising options for the 2019 National Gathering in NSW, Latest Flood Update. Holiday Dates Calendar - just updated with 2019 school term dates, school holidays, & state & national public holidays Australia-wide. 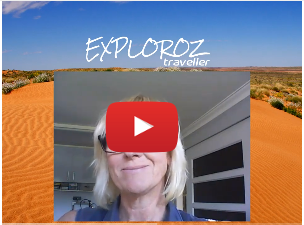 We've just created a new buyers tutorial for the ExplorOz Traveller app that contains a very clear overview of how to buy the app, costs, options, installation, storage and all your questions answered. Some of you might have noticed a slightly new approach to some of our social media and graphics. The reason for this is that we've just enlisted the services of our 18 year son, Leon Martin. Leon is studying a Bachelor of Creative Media course at university, and is also a freelance photographer, and graphic artist. Leon has come on board to do our business graphic design & production, and to take charge of our social media, especially our Instagram account. You can see Leon's work portfolio on his website. You can follow him on Instagram, Facebook, and LinkedIn. In the top left corner of our website you'll see the word "MENU" - click this to find your way through all the different areas of our website and to find our Contact details, which include all our links to our social media accounts, plus our email address, office phone number, and Live Chat service. You can also click any of the social media icons located at the bottom of every page of our website - they look like this. Use our Hashtag #exploroz to share your pics too! Member Nick & Jane have been busy researching possibilities for the 2019 National Gathering. You may have seen his file posted into the Members Documents area (see https://www.exploroz.com/Utilities/FileDownload.aspx?gid=161800) back in November last year when planning first started and various posts in the Forum where he has sought input from the rest of the ExplorOz Community. Well he's now got it sorted and proposed dates and venue for a 2019 National Gathering to be held in NSW. Please see the event page on the website here in the ExplorOz Trips & Gatherings page to find out all the details. Nick has also posted a thread in the Forum seeking your input regarding suggestions for Fundraising activities to be held at the gathering. Please take a look and give your input, regardless of whether you can intend. Fund Raising Options. Please support these gatherings which are non-commerical and free. Whilst they are conducted under our brand, we are not involved in any of the planning or logistics. These events are social gatherings for Members, organised by Members. If you're not a Member, and would like to join, you are welcome to join other gatherings but we request that the National Gathering is for Members only - so why not join up for just $49.99 (or $29.99 if you buy our app). See Membership Options here. If you have received this newsletter via email then you have a registered ExplorOz user account. This could be either a Visitor account or a Member account. To find out the status of your account, open the website (click here) and look in the top right corner for either ACCOUNT or LOGIN. If you see ACCOUNT, then you are already logged in and can click this word to open your Account to check details. If you see LOGIN, then you are not logged in and should click this to enter your email address and password to login. If you are unsuccessful, you can click the Forgot Password link shown on that same page. A free account is a called a Visitor account. A paid subscription account is called a Member account. Membership is not auto-renewing unless you have purchased a Lifetime Membership subscription. Members will receive email reminders to help ensure you don't miss out on the early-bird discount we offer for renewals paid before the expiry date of the existing subscription. If you don't wish to renew, you can simply do nothing. If you let your Membership lapse when the subscription expires, your registered ExplorOz account details will not change. You will still be able to login via the same email address and password. You will not however be able to access any of the Member tools, site, features or benefits. (See https://www.exploroz.com/membership/rewards.aspx). Each individual can only have 1 active user account per email address. Sometimes people get in a pickle when they register the same email address multiple times because each time you will be creating a completely new user account which will overwrite the previous account. You should be aware of the User ID of your registered user account as that is your unique account number. For Members, that means if you accidently register another user account with the same email address as already used in your Member account you will have 2 different user ids with the same email address and the system will only give you access to the most recent account. There is only 1 way to fix this - delete the newly created Visitor account. The delete profile option is available from the Edit Account screen. So, if you need to change anything in your account (including change email address in your account) simply log into your account via the website and use the online tools provided to Edit your account. Whilst most people are buying our app ExplorOz Traveller to use our EOTopo map data on their tablet, iPad or phones for in-car navigation, many people are also wanting to know if we have a free solution for viewing the same maps on a PC computer or iMac for trip planning on a larger screen. The answer is YES - just use your PC or iMac and open our website in your web-browser (ie. Chrome or Safari) and go to the EOTopo page (click here, or use the site Menu to go to EOTopo). On the EOTopo map we show the 2018 EOTopo Online Map, which you can enlarge to fullscreen. This map will zoom to Level 16, which will display the map data at a resolution of 1:18,000 (18K). To move around the map, simply click and drag the map area. Note that the EOTopo online map also displays the Places icons as clickable overlay features from zoom level 10 and above. Click any Place icon to open a full page of information with further details, which might include description, photos, traveller reviews etc. When you are viewing the map, the address bar in your web browser will capture a permalink to the coordinates of the centre of the map window you are viewing. You can copy/paste this url if you'd like to capture a specific part of the map you have selected to come back to for future reference (or to send another person a link so they can view your selected area on the map). Obviously this free solution will only give you access to the map and not the navigation features which are part of the app. If you want to create Private Treks etc on a PC then you will need to purchase the Windows version of the app from the Windows store.